It is not as easy to find information on Fra Diavolo as one might think. He was a bandit, a brigand —anything from Robin Hood to Al Capone, depending on the source of your information— active in the Bourbon defeat of the Neapolitan Republic in 1799. First, however, there is much more information available on something called Shrimp Fra Diavolo. I found a recipe that serves 6. I should use 36-40 medium-size shrimp. If I can't find peeled raw shrimp, I can substitute peeled cooked shrimp. I may try it. Then, again, I may not. The real Fra Diavolo (image, left) was born Michele Pezza in the late 1770s in Itri, not far from Gaeta about 60 miles north of Naples. In 1797 he fled his town to avoid prosecution for having murdered his employer in a squabble. He took up the life of the bandit. He was then one of the first to answer King Ferdinand's call for aid from such outlaws to help retake the kingdom of Naples from the revolutionary government of the Neapolitan Republic, which had successfully sent the Bourbon monarchy packing to Sicily in 1799. He went to Sicily where he was well received by the King and Queen. He was made a Captain in the Bourbon army and returned north where he landed his force of 400 men near Gaeta. He spent the next 6 months harassing the Republican forces and the French troops supporting them. He and his men conducted themselves with such savagery that Cardinal Ruffo, the leader of the royalist Army of the Holy Faith, forbade them from entering centers of large population for fear of the butchery that might ensue. Fra Diavolo —"Brother devil"— was so-called apparently because he had expressed a wish as a young man to enter the clergy and on a few occasions disguised himself as a monk. He was instrumental, with other brigands like himself, in the Bourbon reconquest of the Kingdom of Naples and helped pursue the retreating French forces back to Rome where that city, too, eventually fell with the collapse of the so-called "Roman Republic". Five years of peace then ensued between France and the Kingdom of Naples. Fra Diavolo enjoyed the relaxing life of the ex-bandit celebrity, now the newly declared Duke of Cassano and loyal servant of his king. He would need the respite, however, for in 1806 Napoleon Bonaparte brought his considerable military prowess to bear on the Bourbons of Naples. The French invaded the kingdom and, once again, the Bourbons fled to Sicily, protected by the British fleet. Queen Caroline's plan was as clear as it was futile: retake the kingdom again, the same way they had done before. Cardinal Ruffo was called upon, again, to form another army. He would have no part of it this time, saying that "a man is good for only one such effort in a lifetime." Fra Diavolo, however, answered the call, as did numerous other ex-outlaws of the day. It is moot whether they were motivated by money or by loyalty to their king or by fear of eventually all being conscripted into the French army and sent off to fight Bonaparte's wars elsewhere in Europe. In any event, Napoleon sent his brother, Joseph, to Naples as king. At the top of the list of things to do was cleanse the kingdom of brigandage. Joseph sent out Colonel Hugo (the father of author, Victor Hugo) to hunt down the most wanted bandit of them all, Fra Diavolo. It was only a matter of time, but in the autumn of 1806 Fra Diavolo, with a strong force of 1500 men, but still outnumbered, went back into the mountains to lead a short-lived and ferocious game of hit-and-run warfare with the regular army. At the end he was reduced to the tactic of every-man-for-himself, telling his remaining men to meet him in Sicily, where they would regroup. That was not to be. He was captured alone and exhausted in a tavern in the village of Baronissi, not far from Salerno. He was taken to Naples and sentenced to death in spite of an appeal for clemency brought on his behalf by his nemesis, Colonel Hugo. The King, however, had his own orders from his brother-in-law, Napoleon. 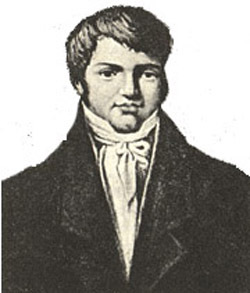 Fra Diavolo was executed by hanging in Piazza Mercato in Naples on November 11, 1806. He apparently went stoically to his death. He wore his Bourbon military uniform.